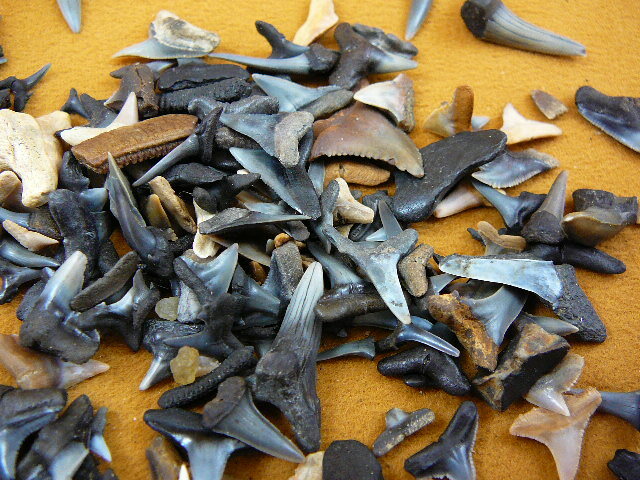 NOTE: These teeth are becoming more difficult to find, less are in the market each year. 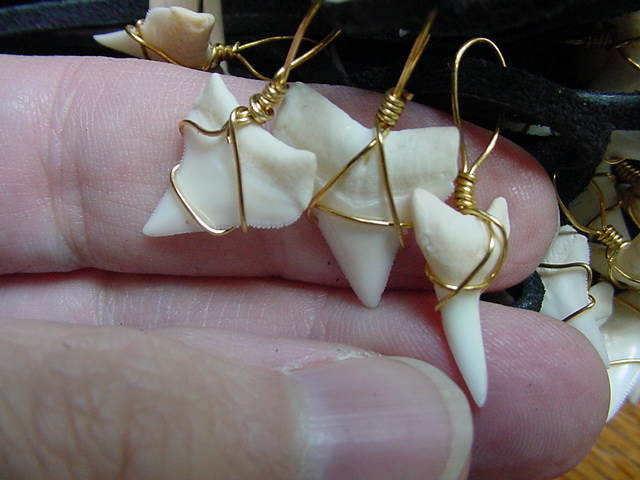 This is 10 dozen jewelry- grade shark teeth, average size 5/8" to 1-3/8", (average 6 species of teeth: tiger, sand tiger, hemipristis, dusky, bull, lemon shark), silver craft wired, on 20" suede leathers. 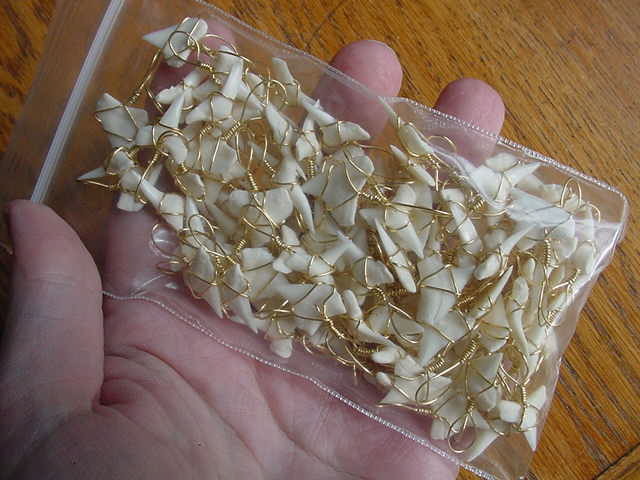 Wholesale price $495 includes insured domestic shipping, which averages $3.75 per necklace, these retail at $10-12; international shipping extra, please inquire. 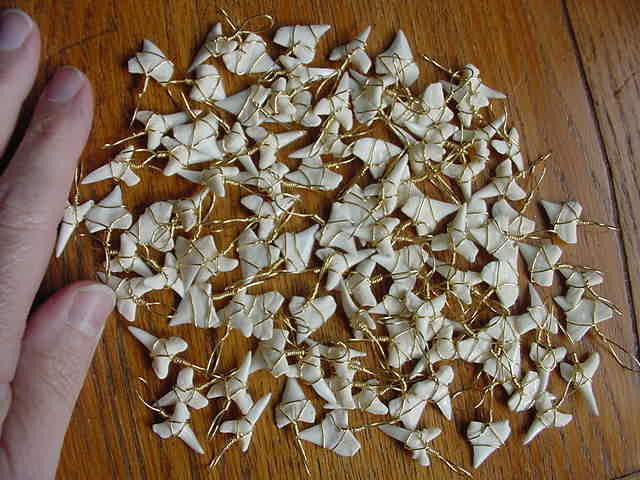 10 dozen minimum order. 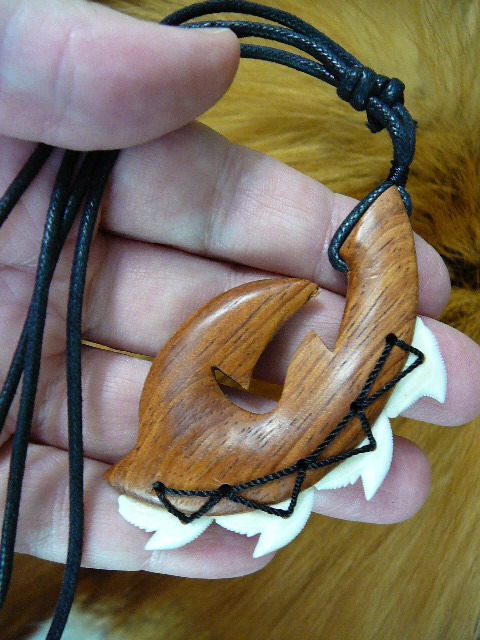 $300 minimum does not apply. 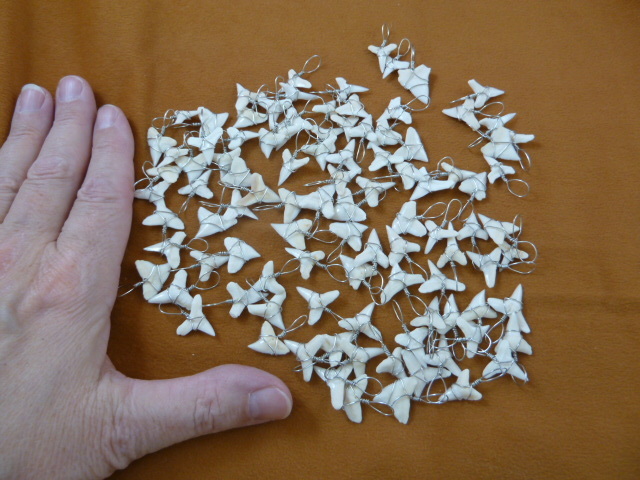 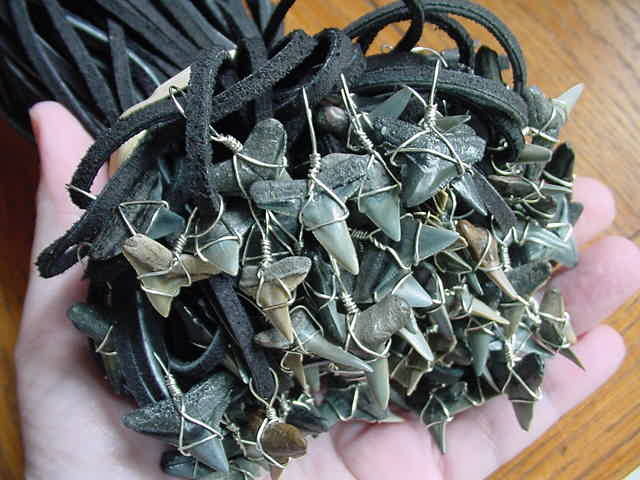 Ten dozen fossil shark teeth, Florida locale, silver color craft wired; 10 dozen black suede necklaces included. 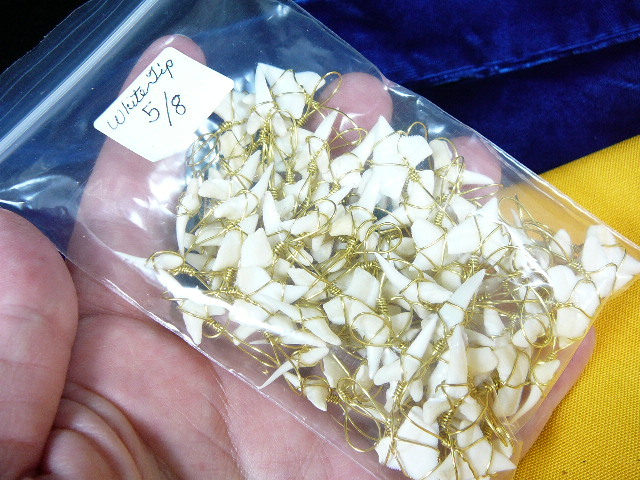 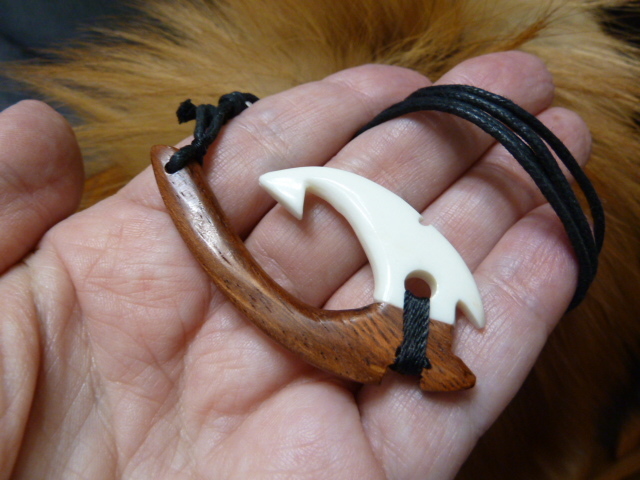 Ten dozen (120) Modern Oceanic white tip shark teeth 5/8" average, Indian Ocean locale, gold color craft wired, with 120 black suede necklaces. 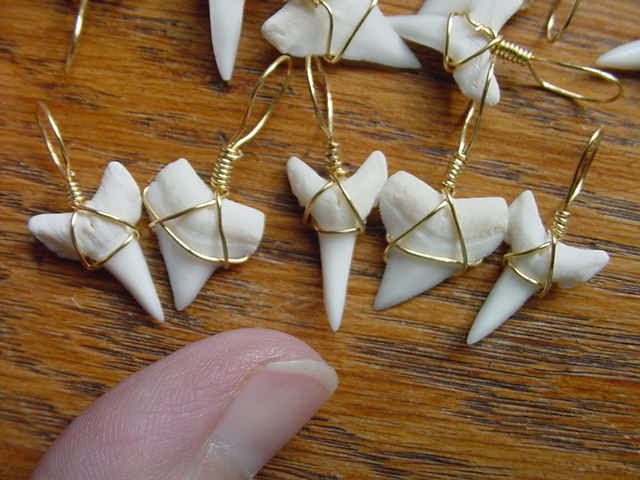 (100 available). 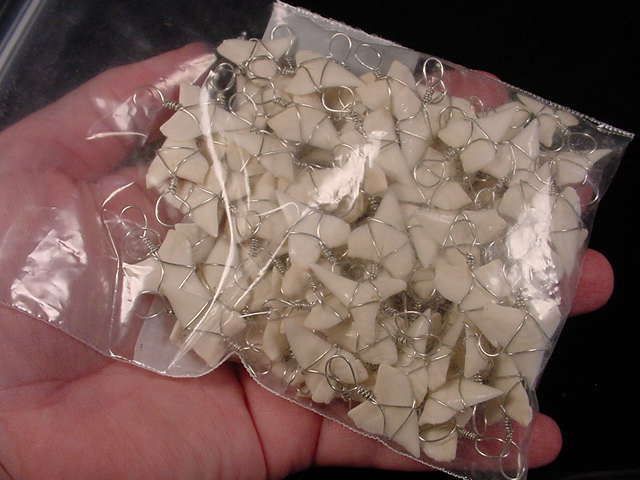 This is exactly what you would receive. 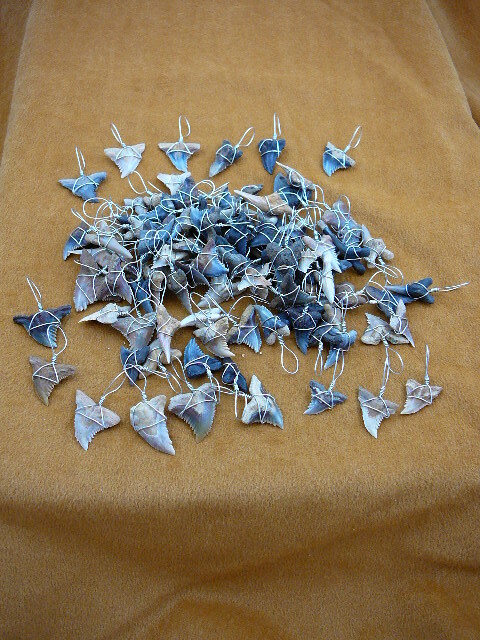 Includes shipping & insurance in the U.S.; outside the U.S. additional postage, please inquire. 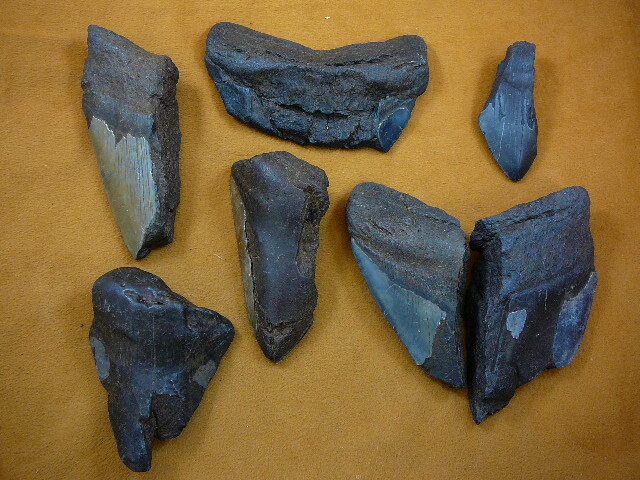 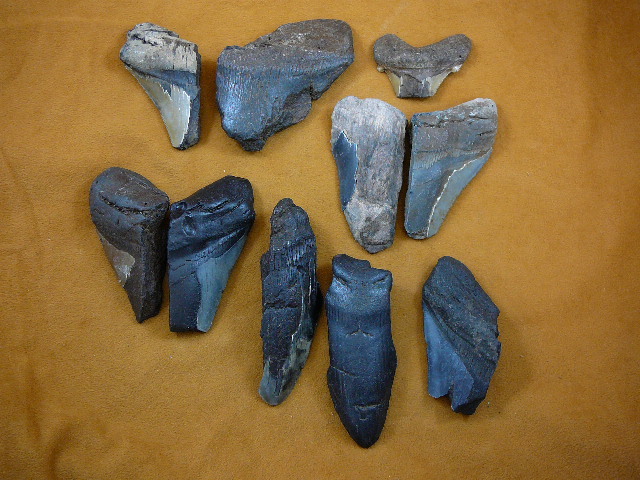 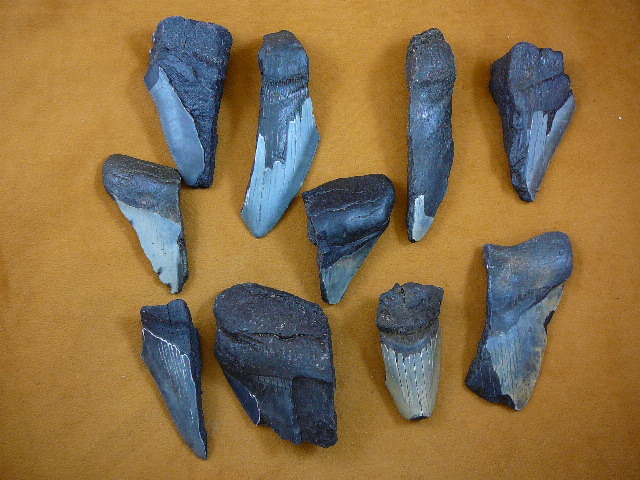 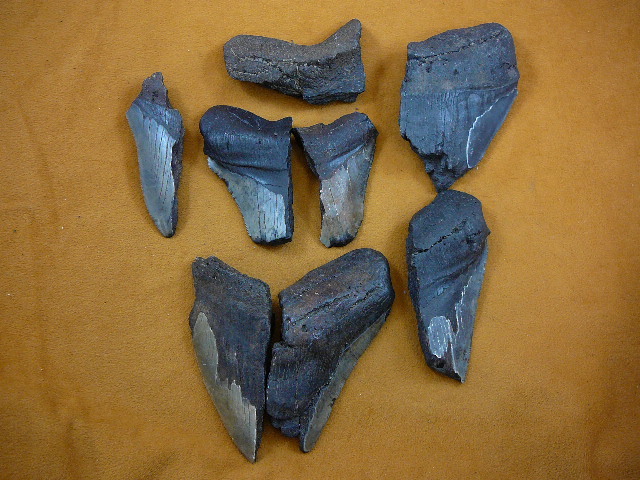 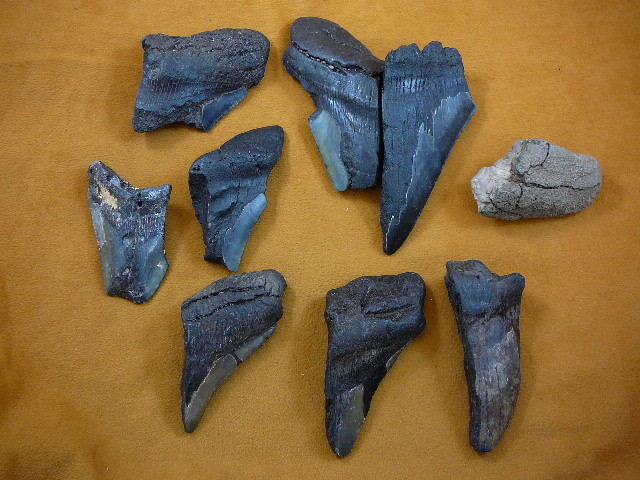 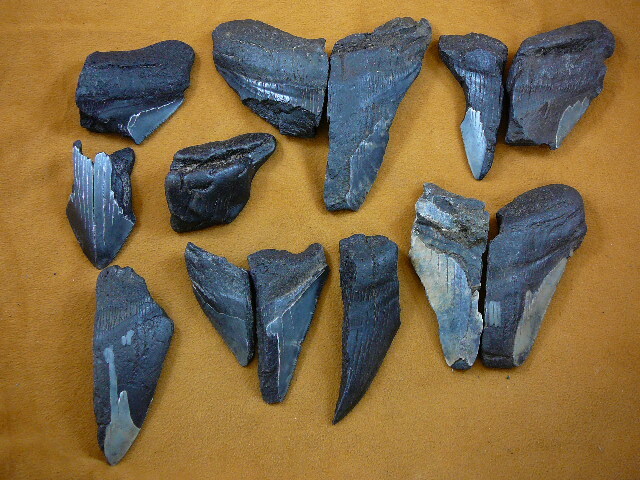 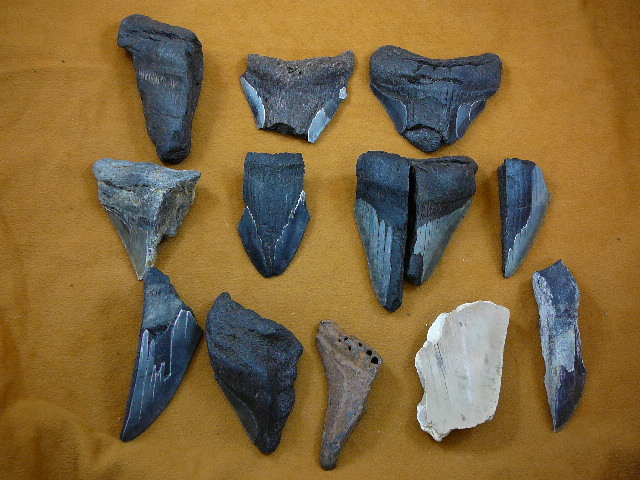 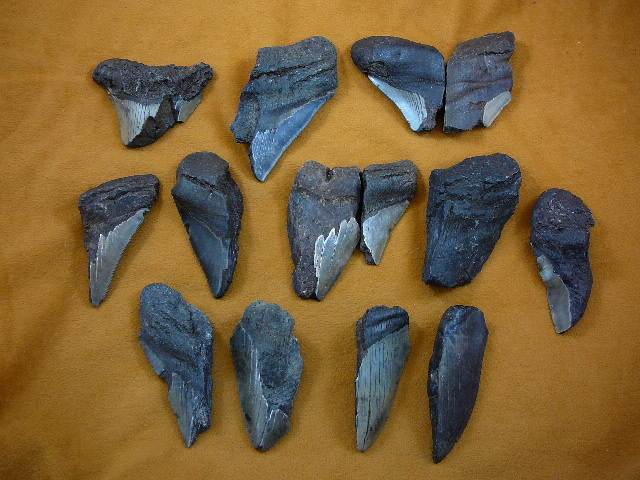 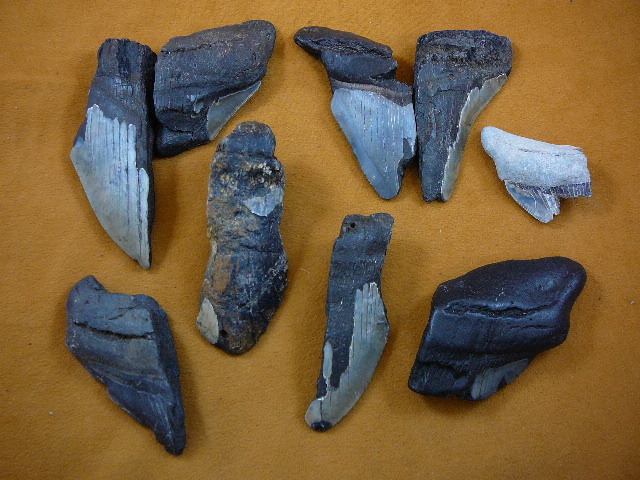 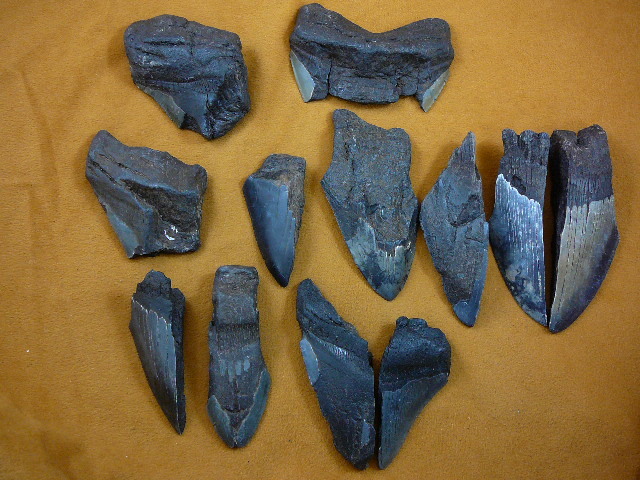 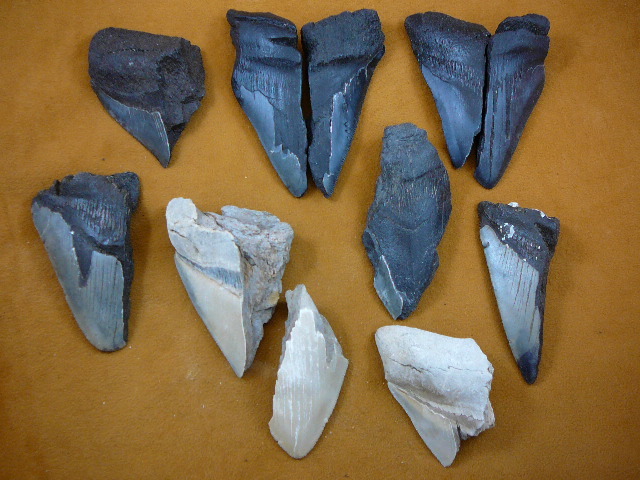 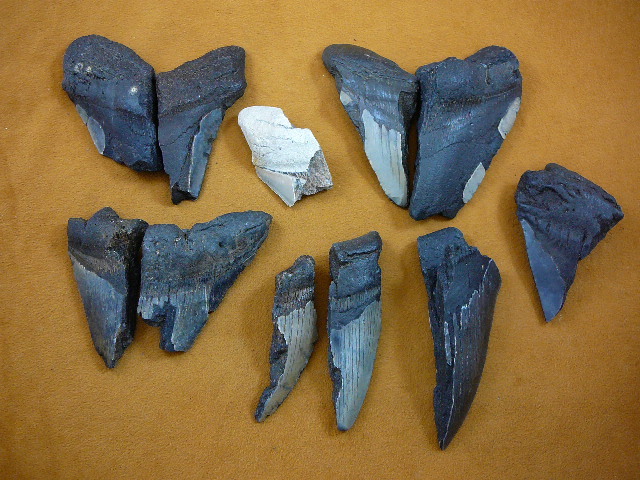 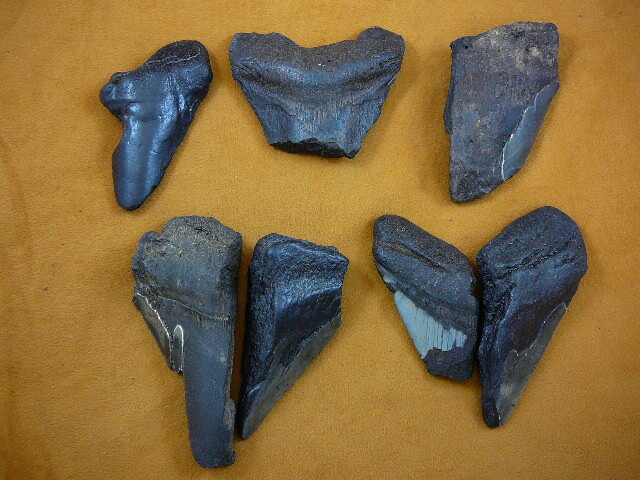 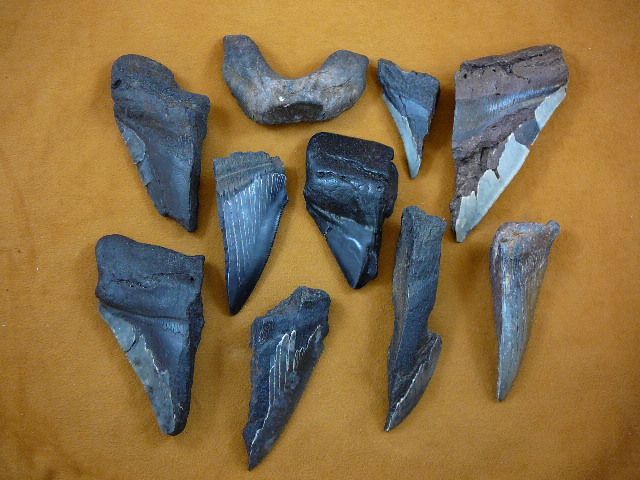 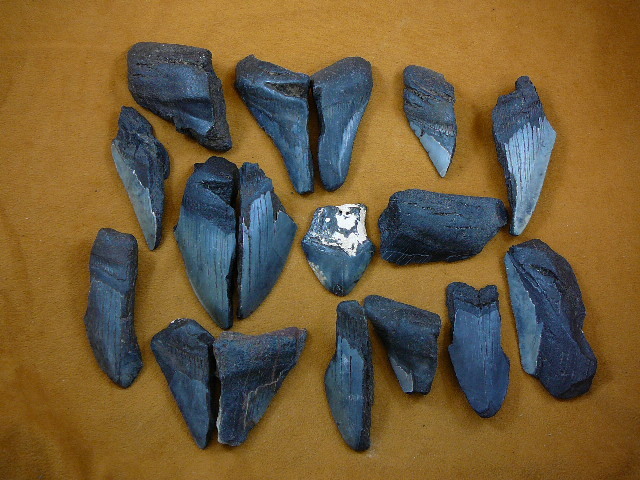 (Average 6 species of teeth: tiger, sand, hemipristis, dusky, bull, lemon shark) includes Sandtiger shark teeth up to 1-3/8"
#SW-1-J Fossil shark teeth, Florida locale, silver color craft wired. 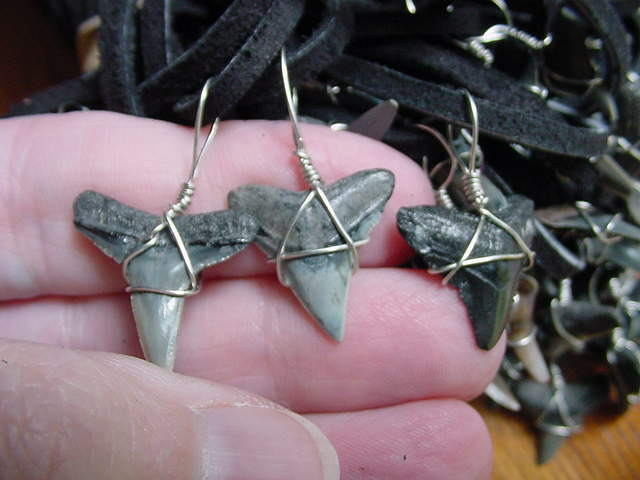 Prices include shipping & insurance in the U.S.; outside the U.S. additional postage, please inquire. 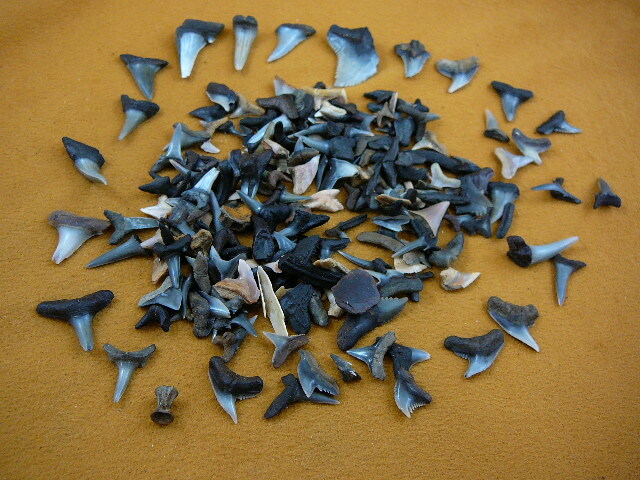 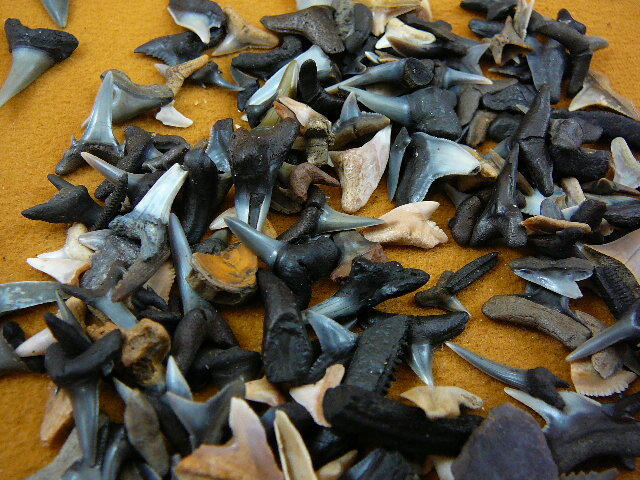 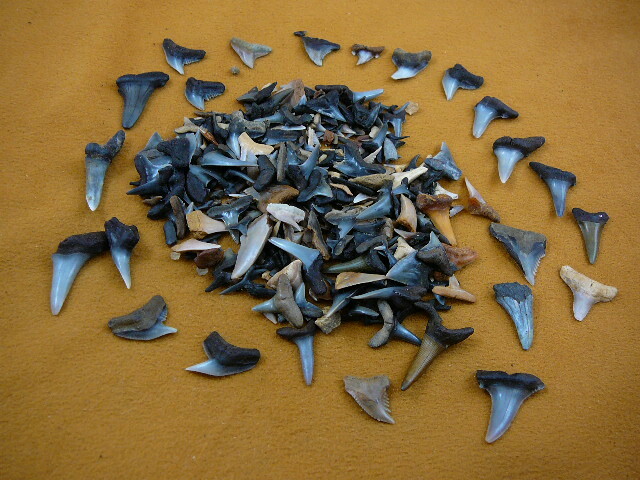 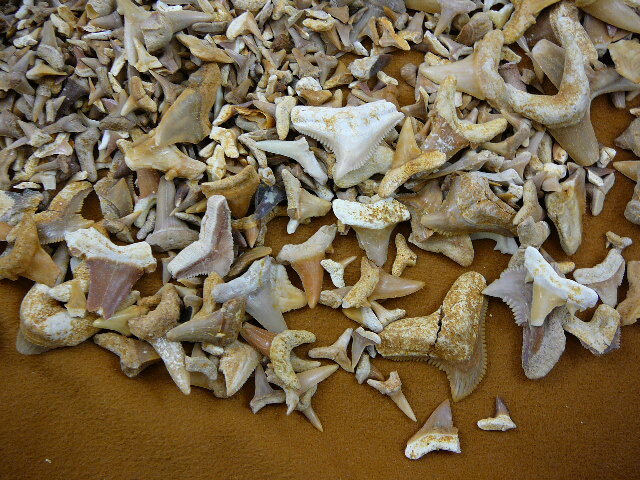 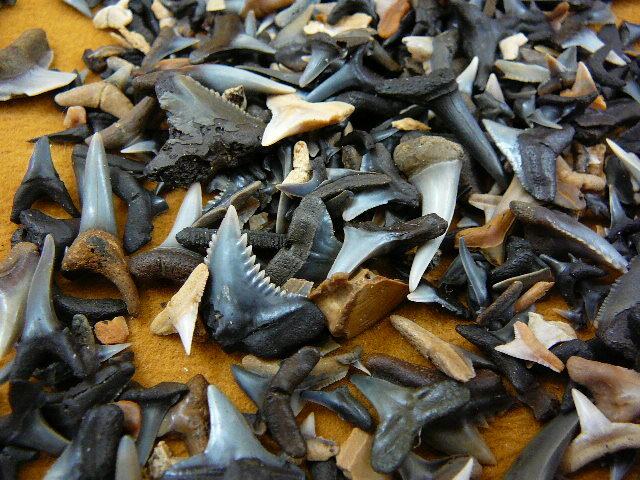 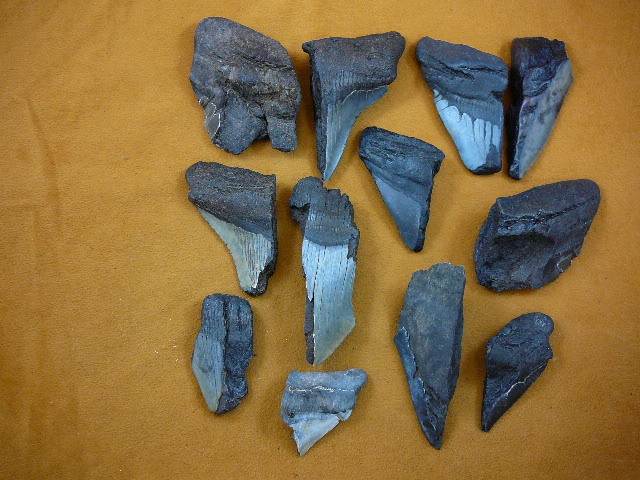 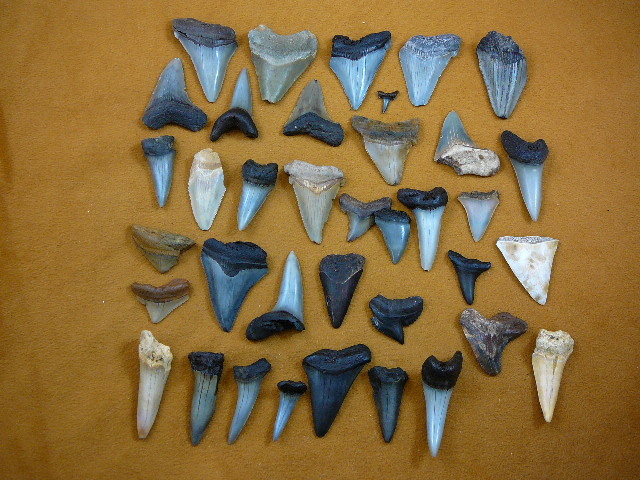 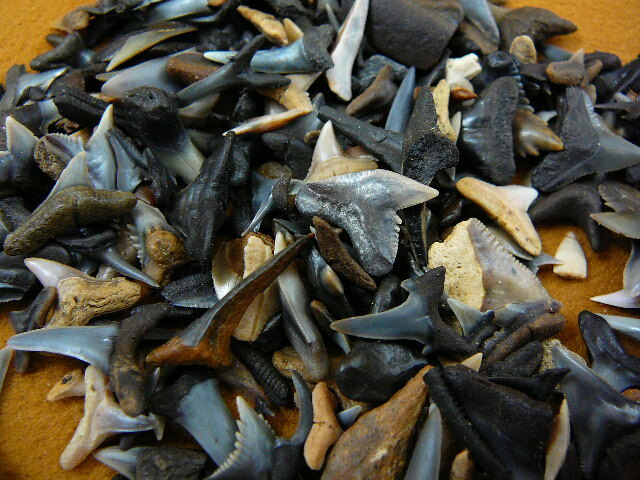 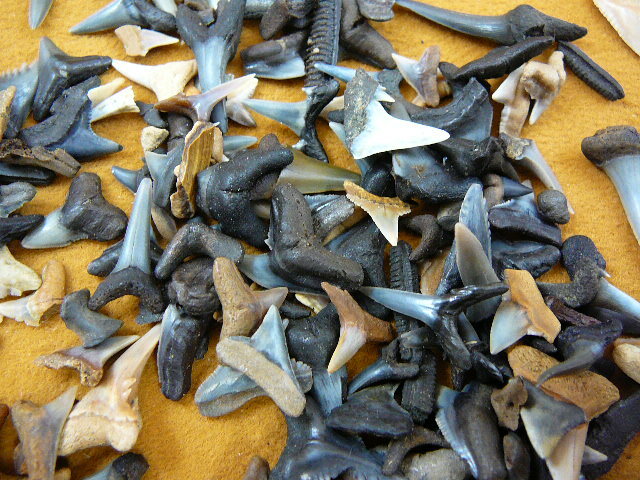 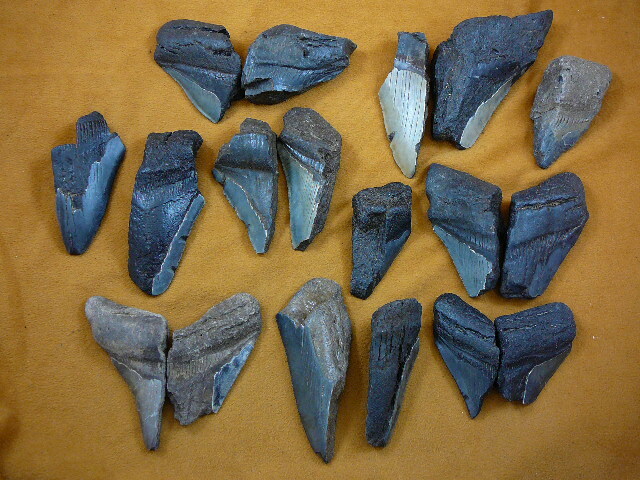 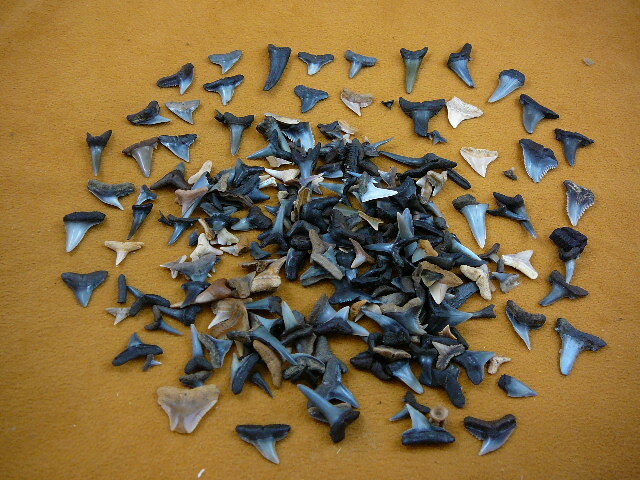 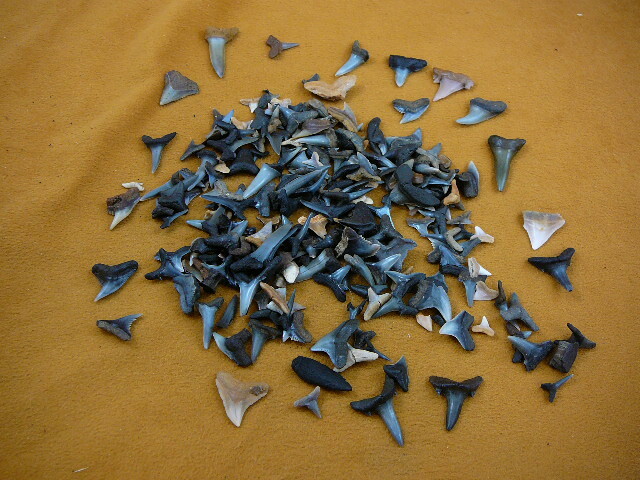 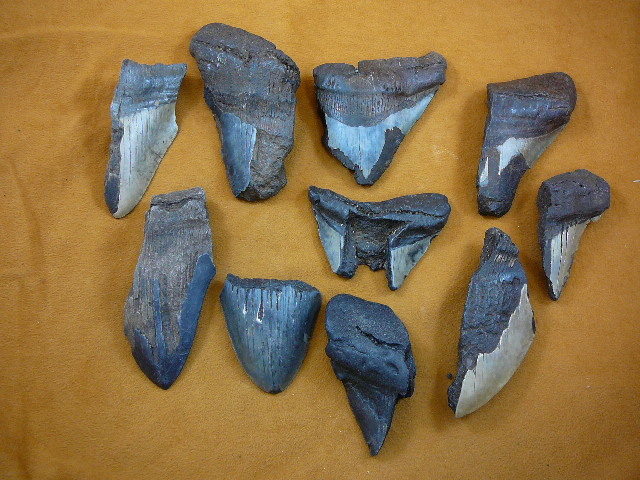 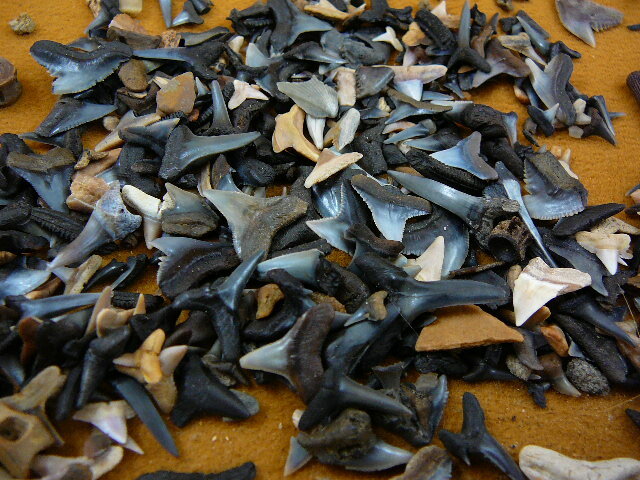 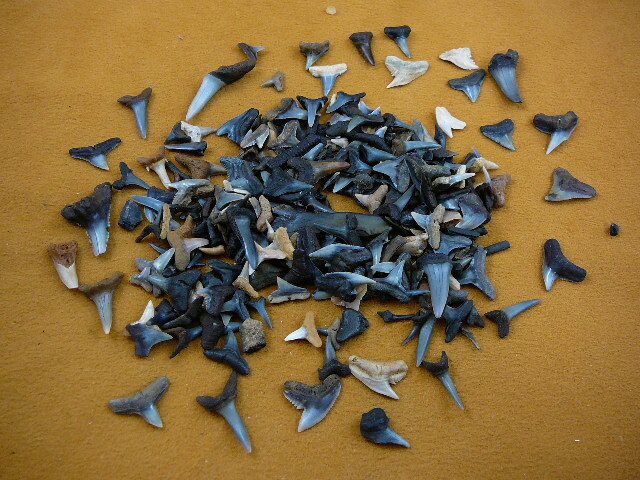 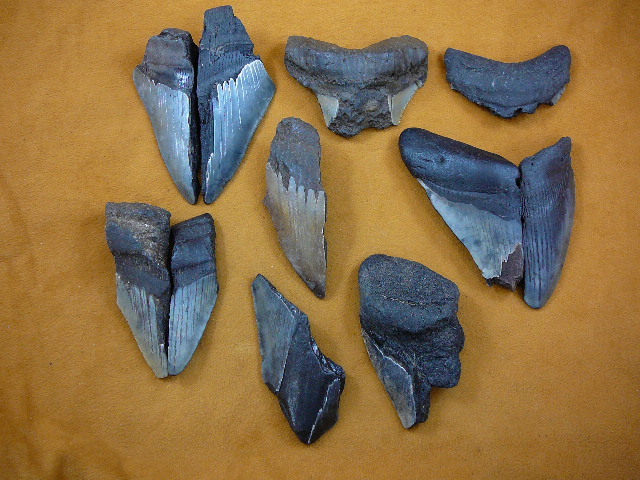 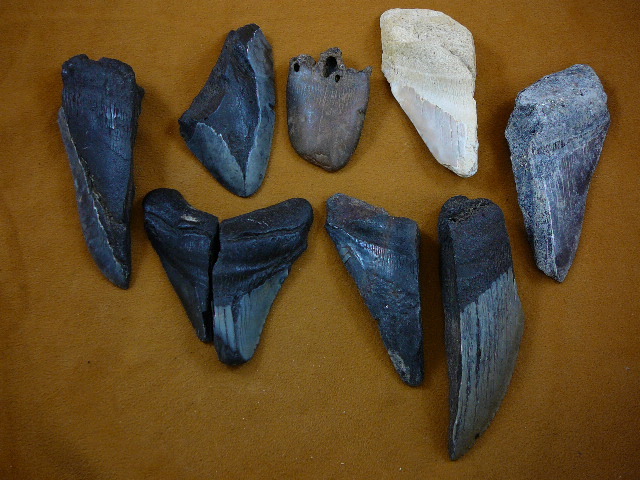 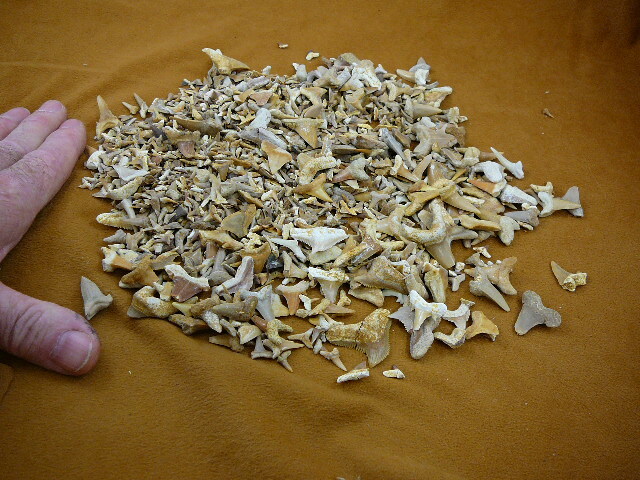 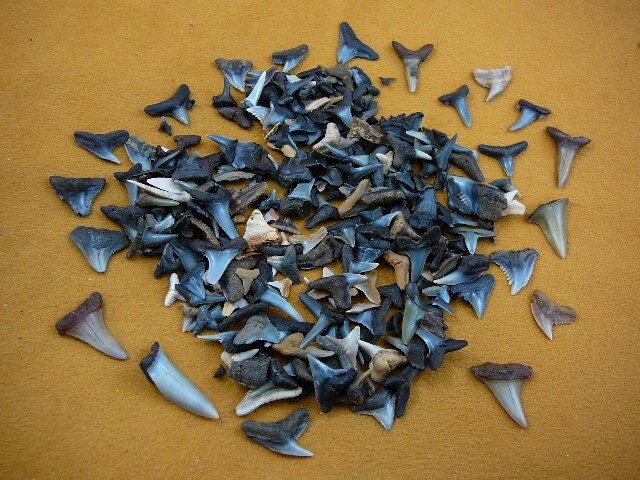 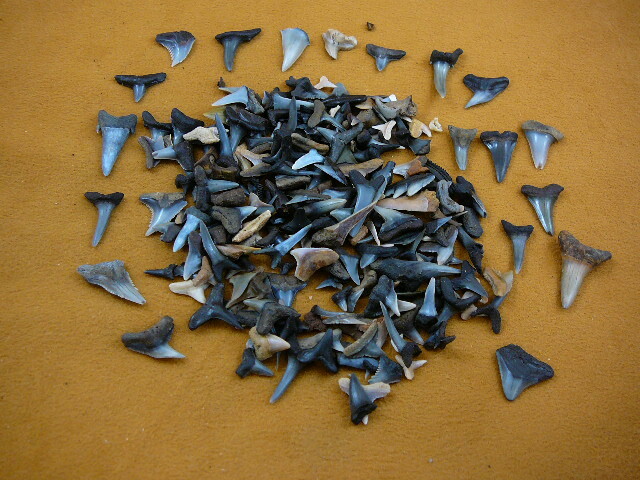 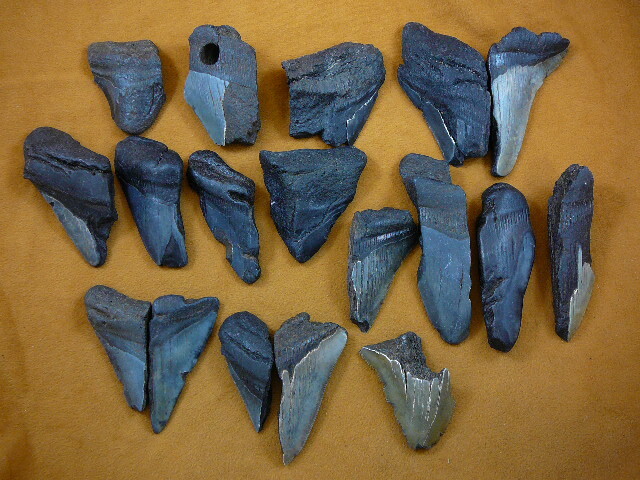 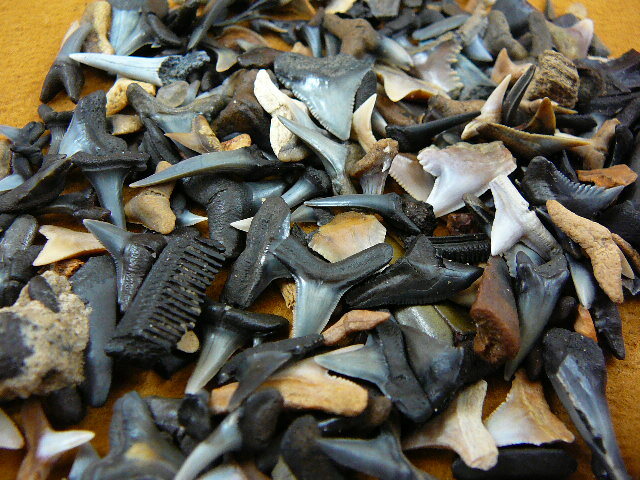 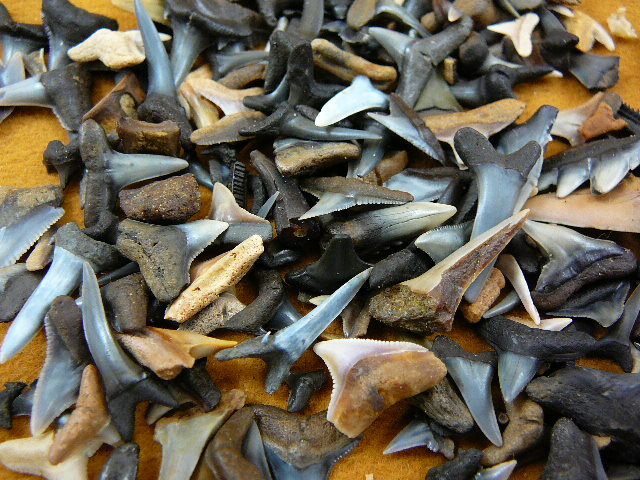 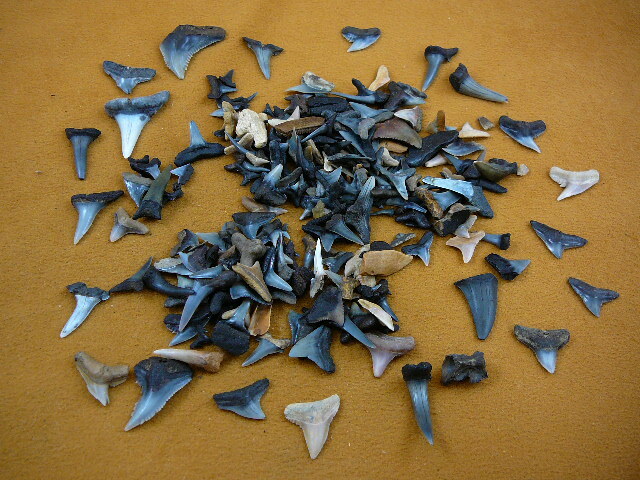 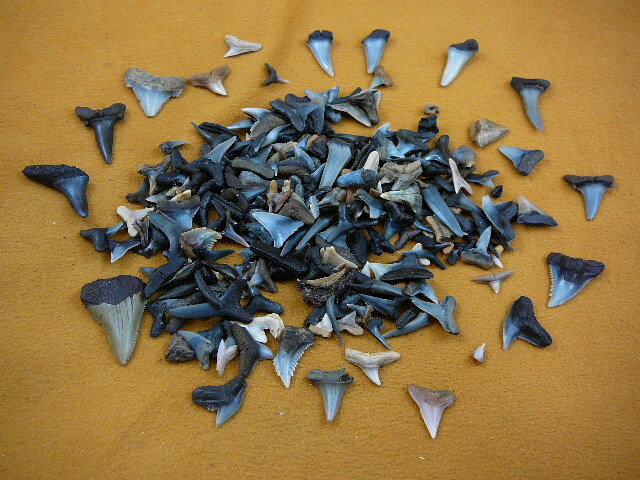 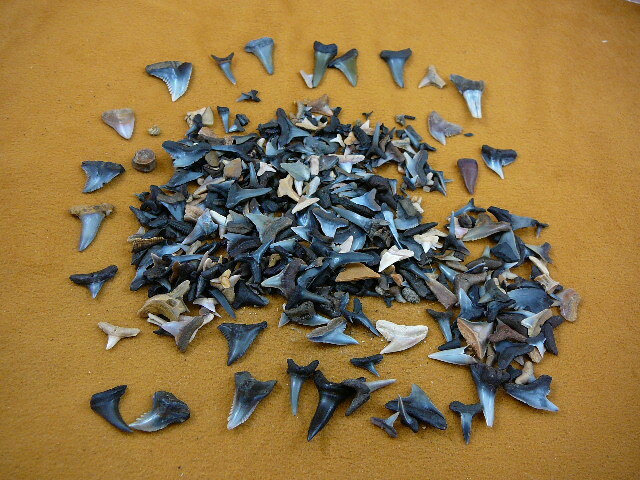 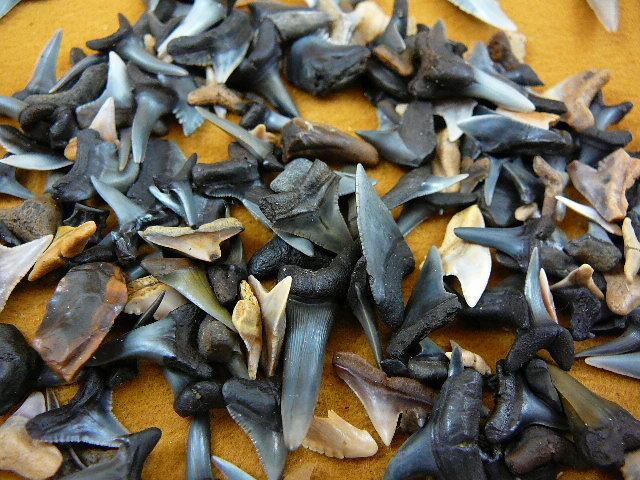 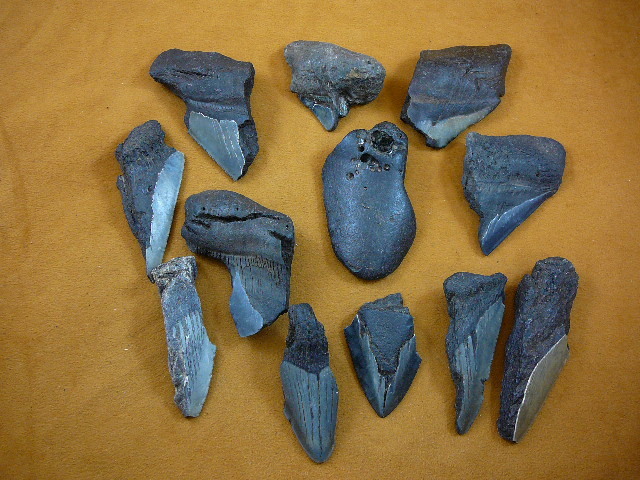 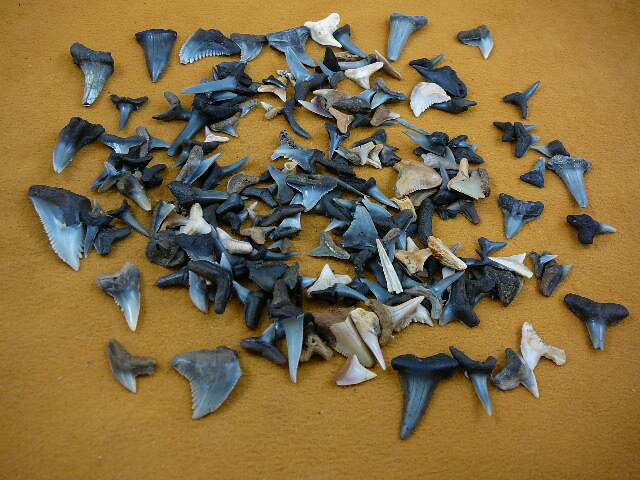 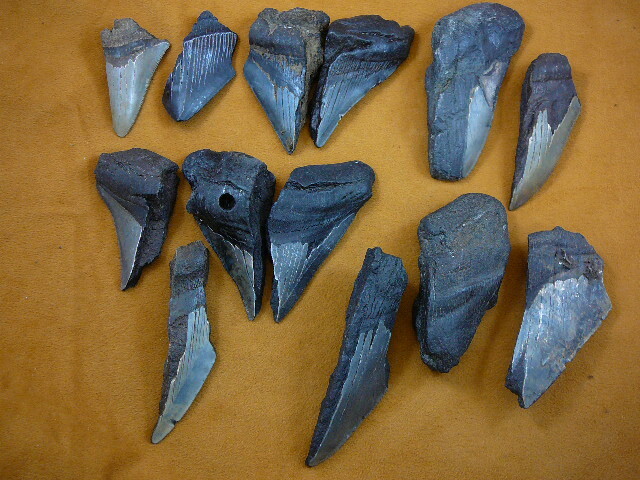 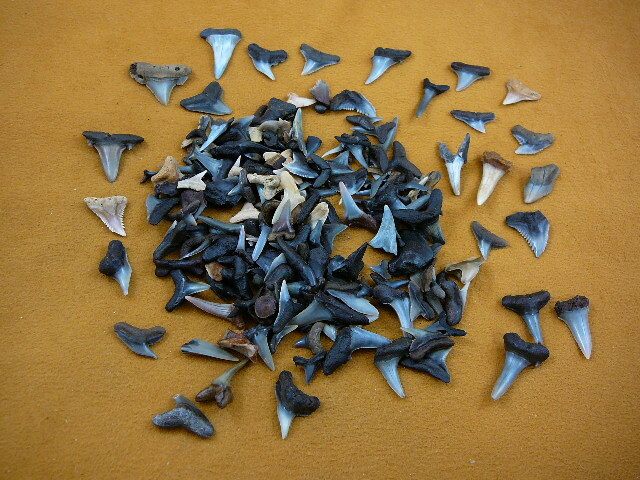 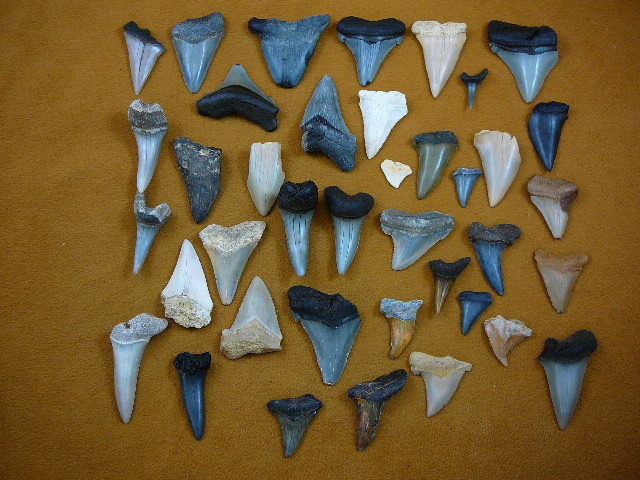 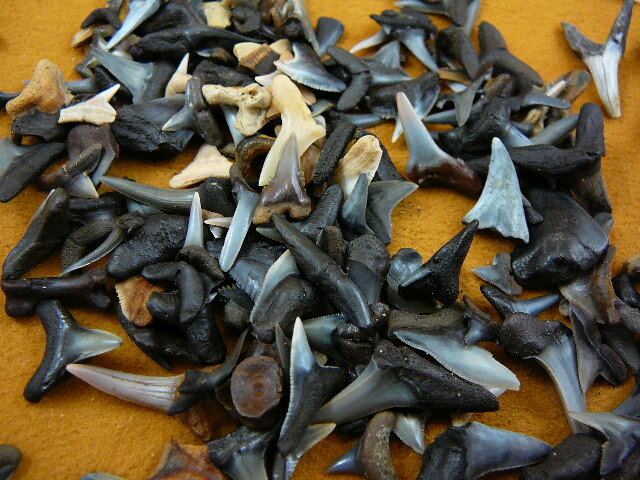 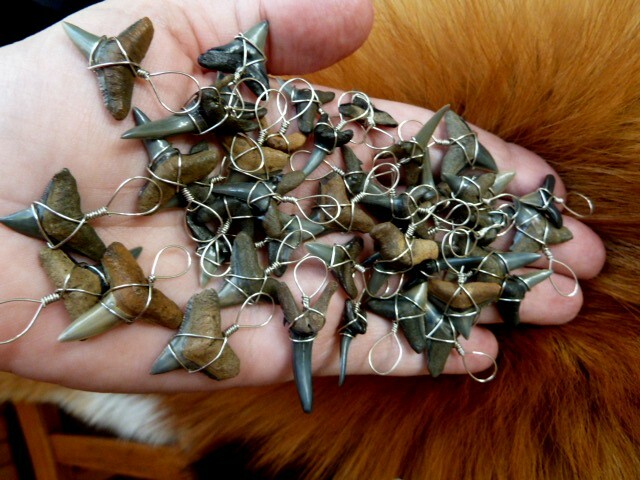 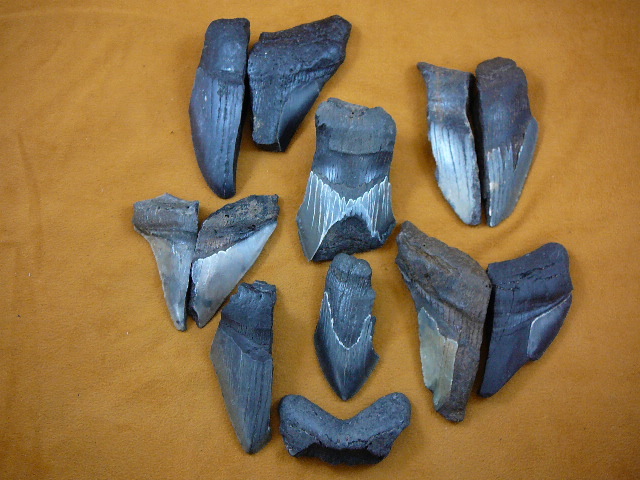 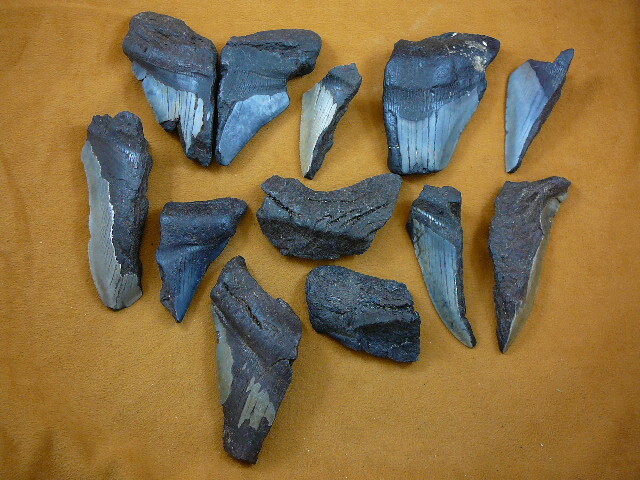 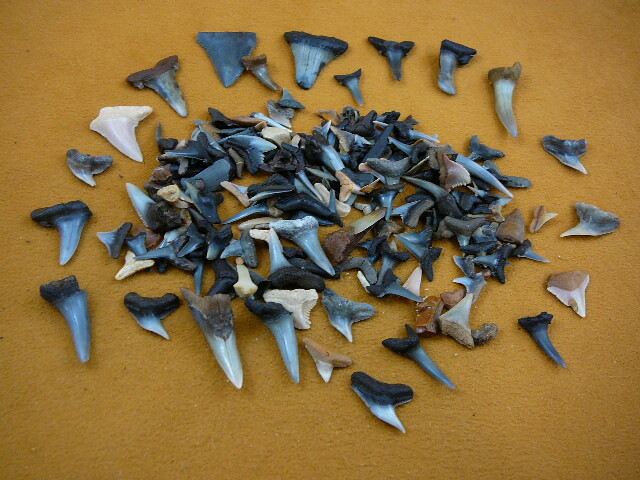 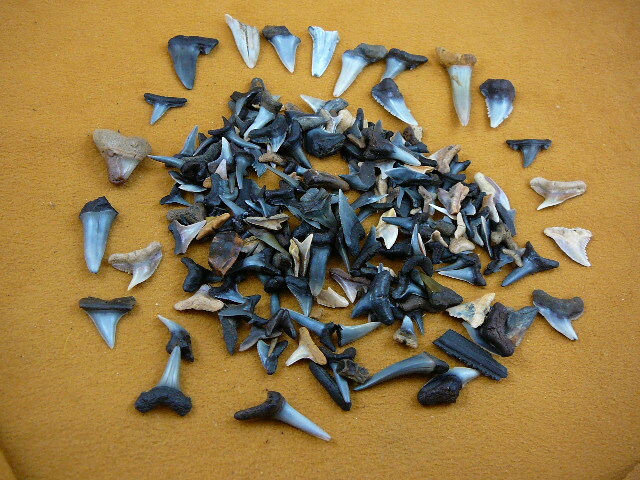 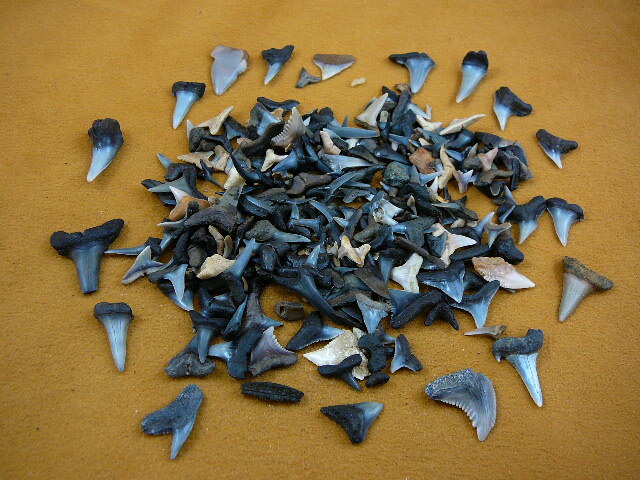 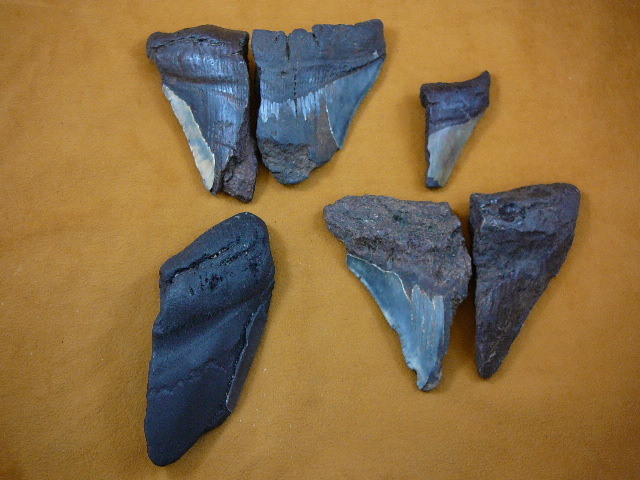 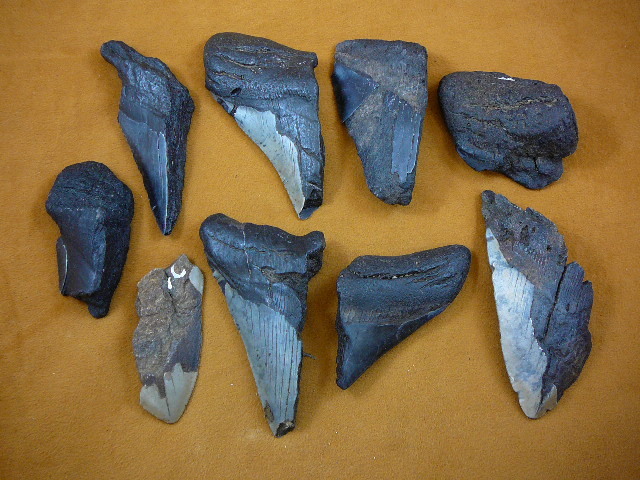 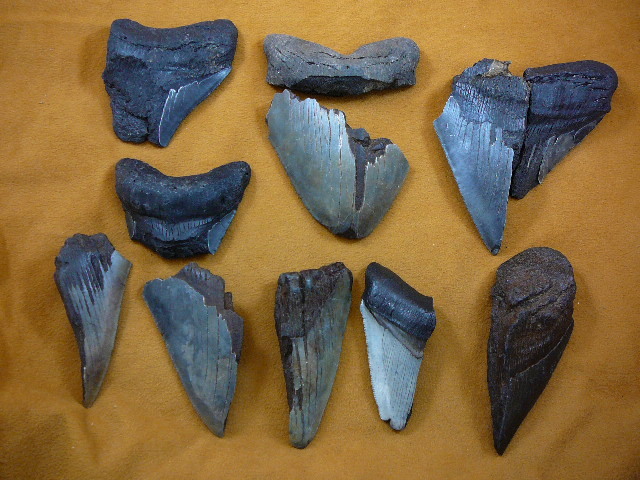 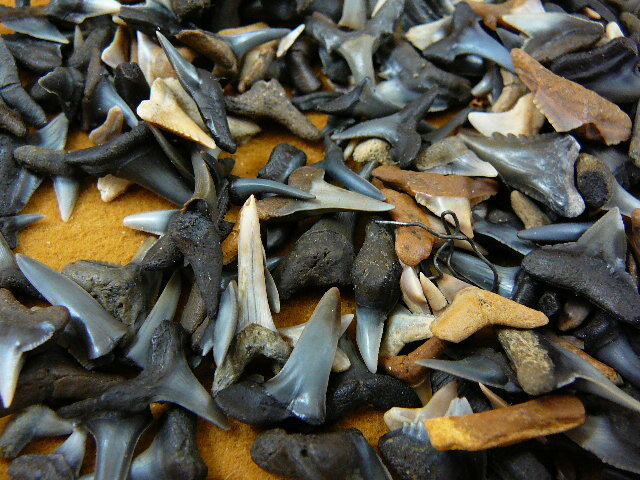 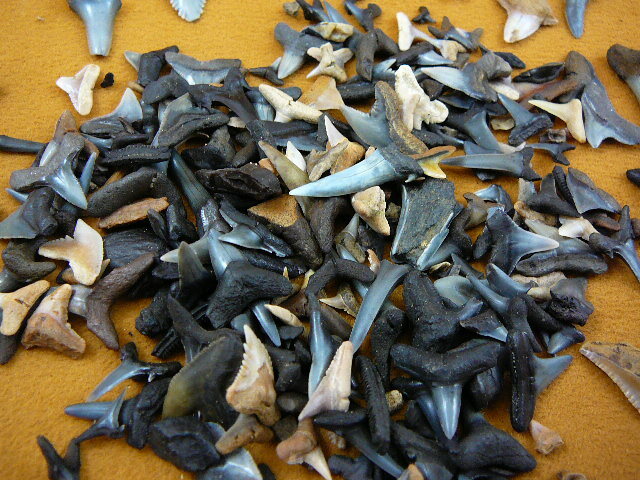 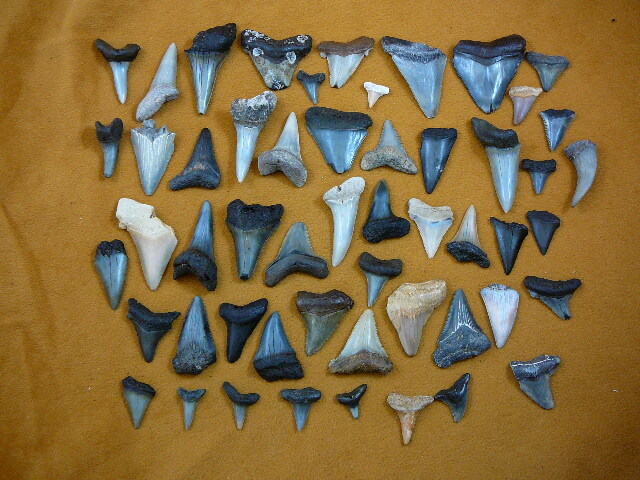 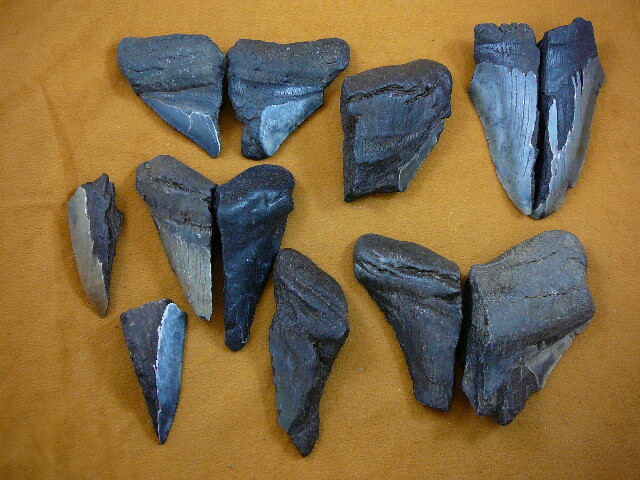 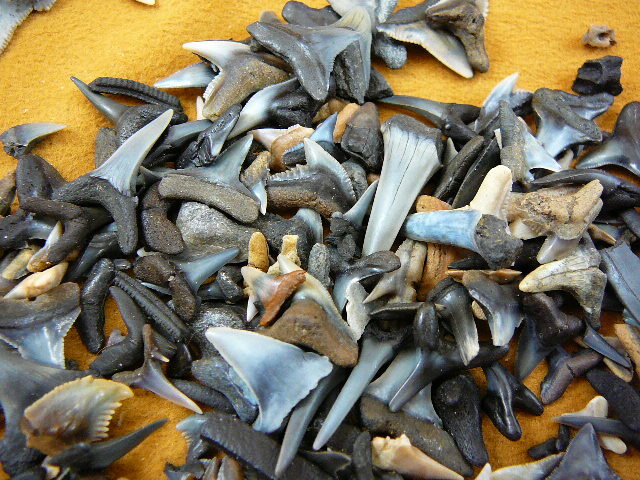 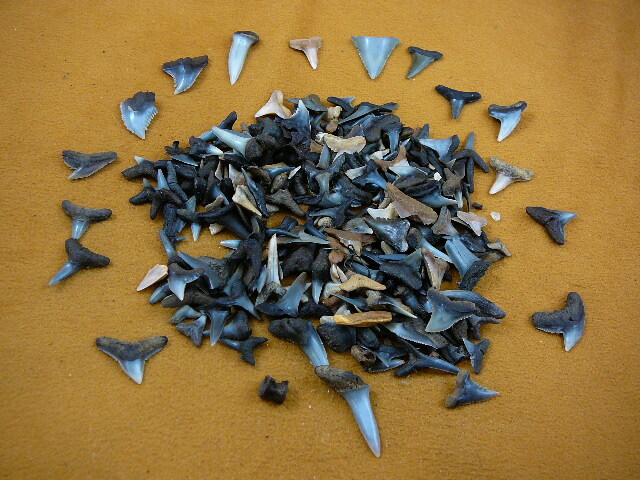 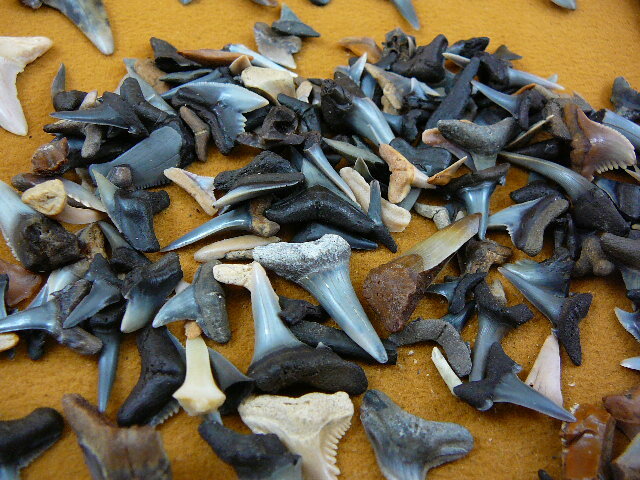 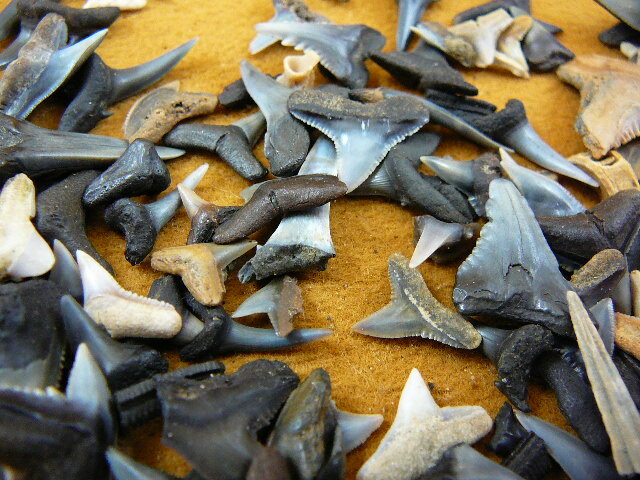 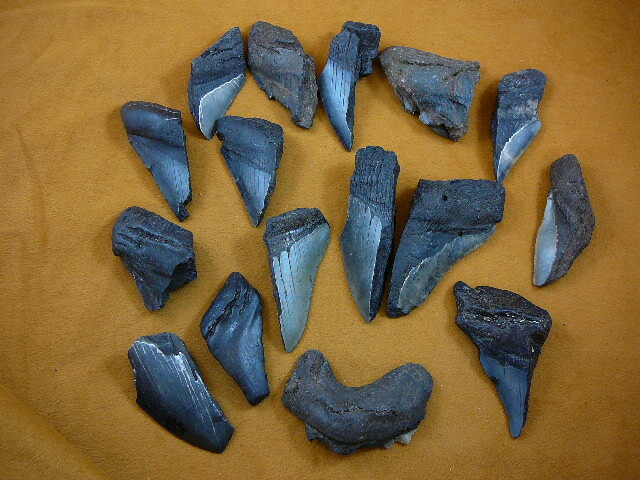 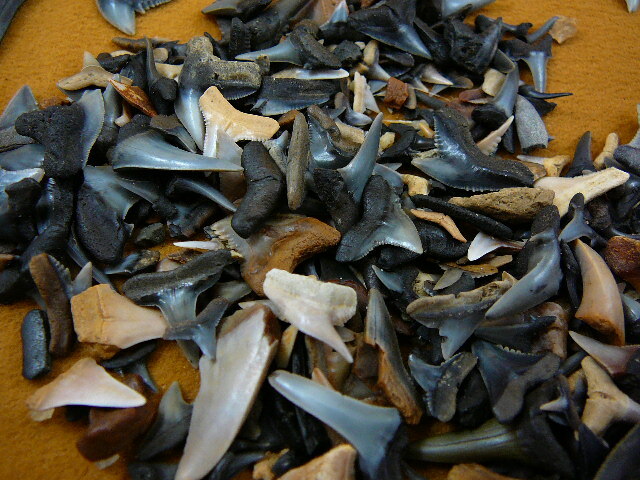 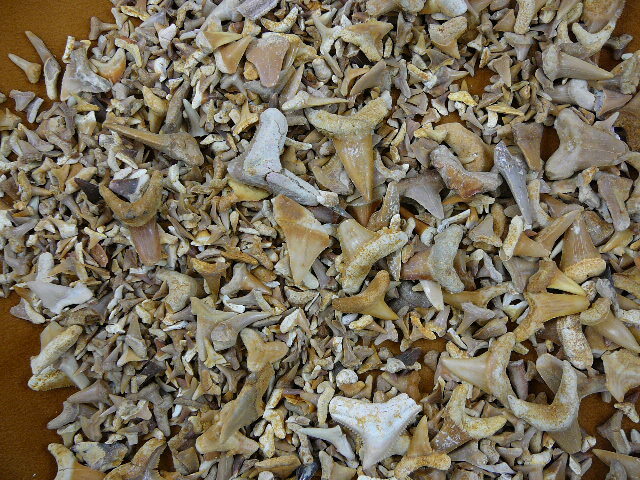 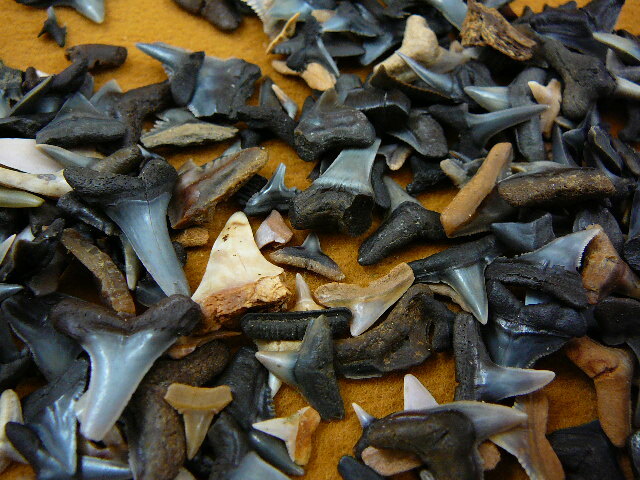 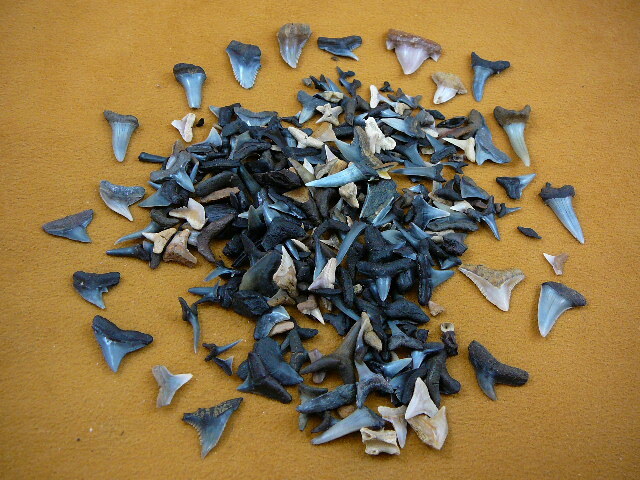 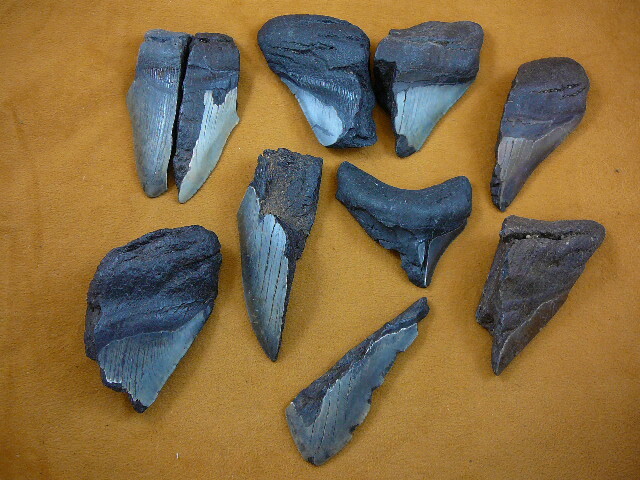 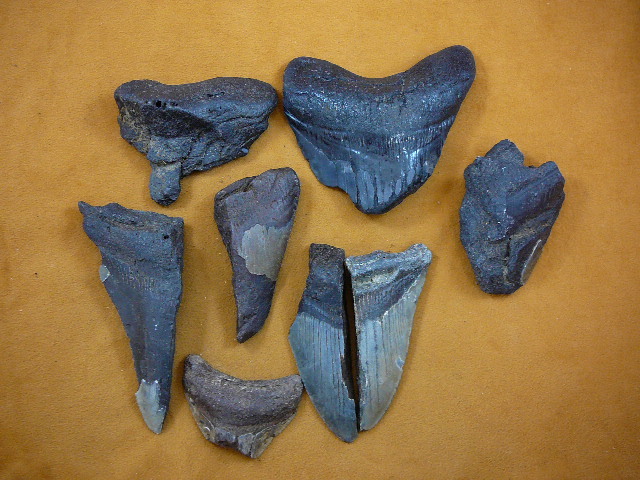 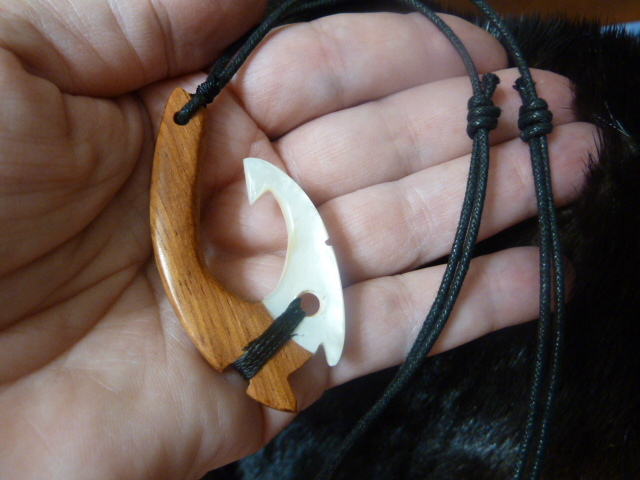 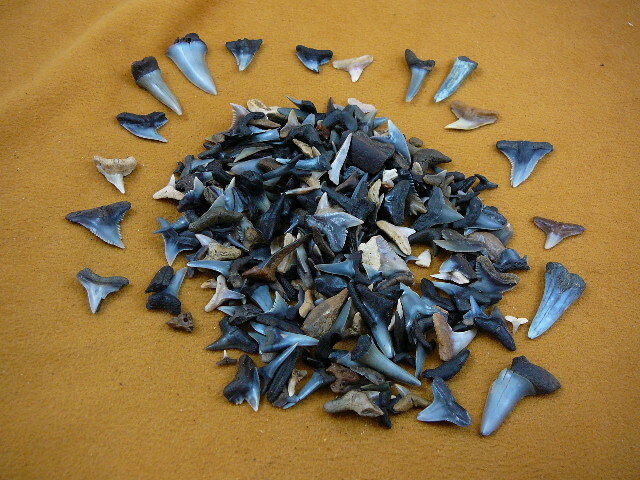 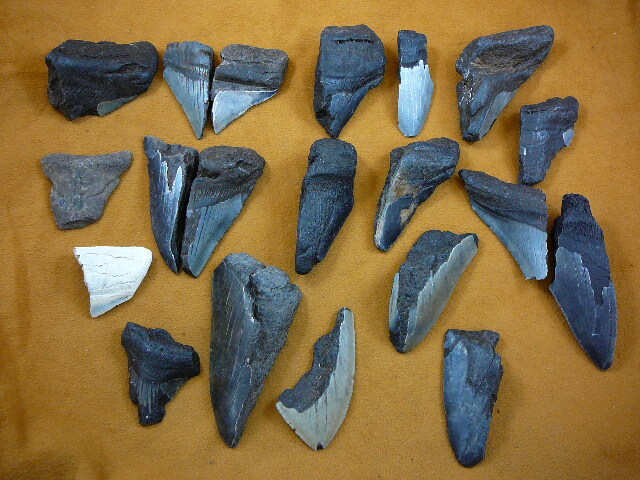 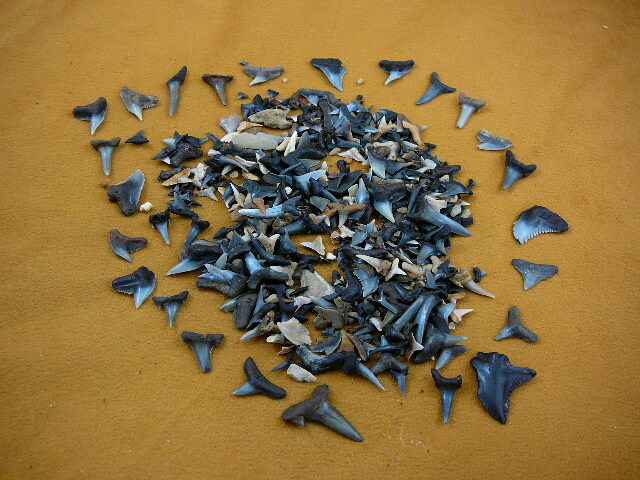 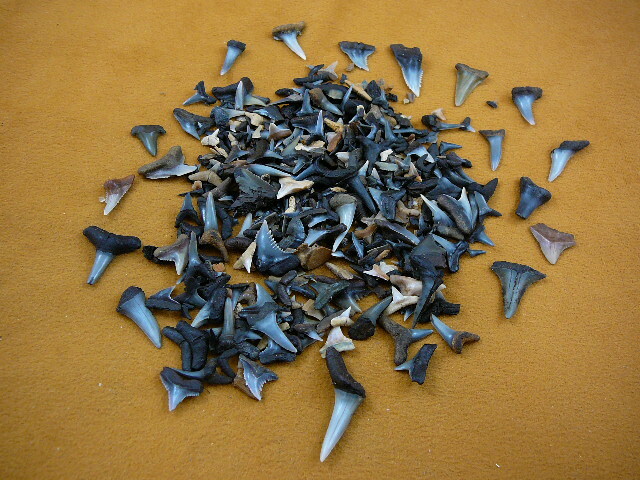 We have MANY POUNDS available of these AND MAKO SHARK TOOTH SHARDS (see small collections of the makos on Sharks page 6). 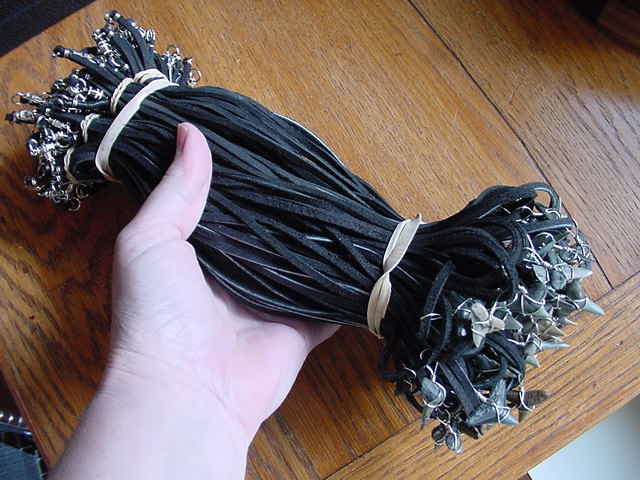 Please inquire as to the number of pounds you wish. 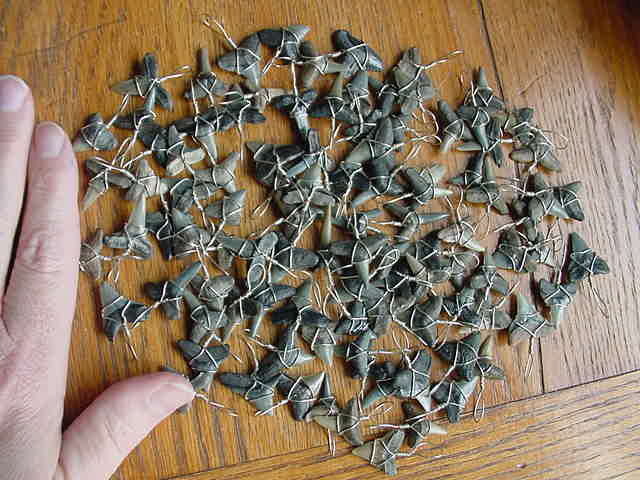 #SW-3. 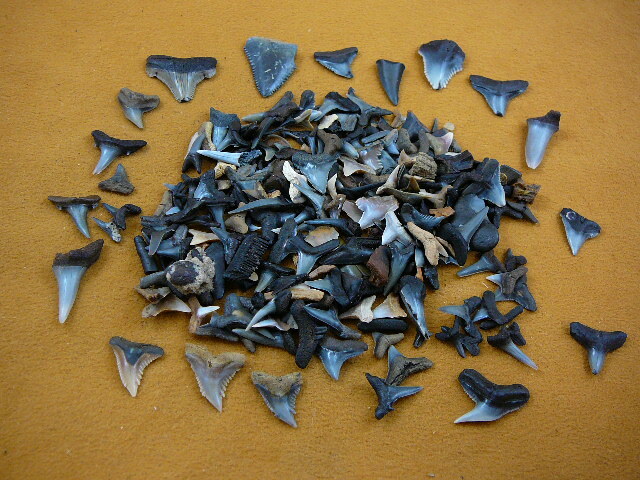 One pound of mostly non-jewelry quality fossil shark teeth from Morocco, includes other fossils such as ray mouth plate fragments, shark vertebra, squalicorax teeth, mackerel shark teeth etc; average size of teeth & fossils is 1/2"-1"; 1 pound minimum. 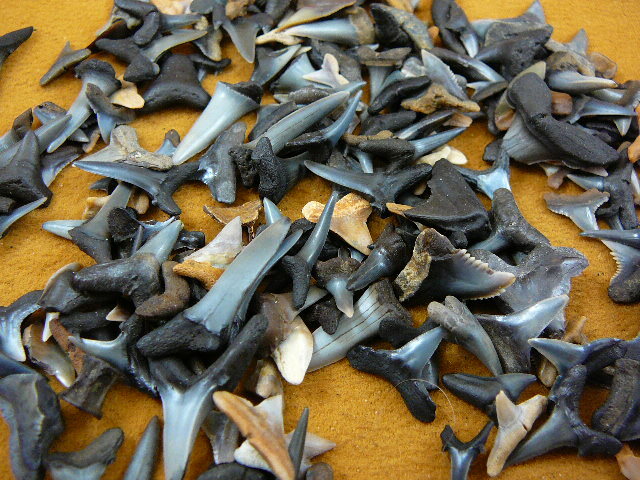 Average sizes: From 1/2 to 3/4"
Possible species:Oceanic white tip, hammerhead, spottail, silky, sandbar, spinner, lemon, bull, dusky shark. 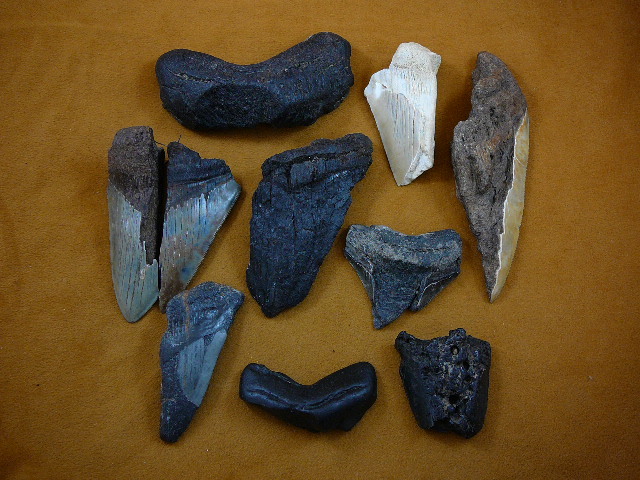 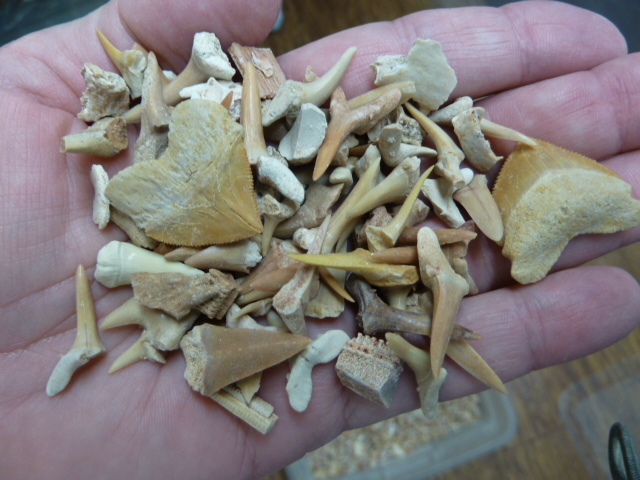 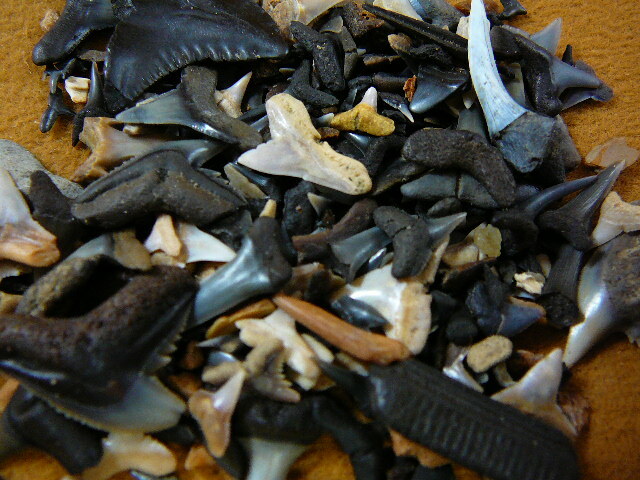 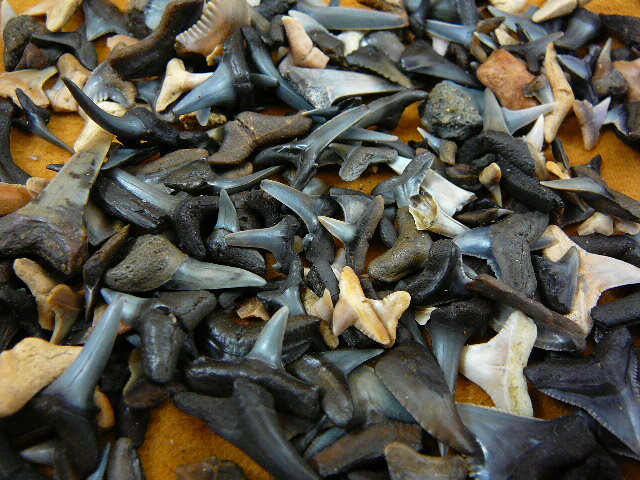 Mix of jewelry and non-jewelry fossil shark teeth, Florida/East coast locale, average size from micro 1/4"-1"+. 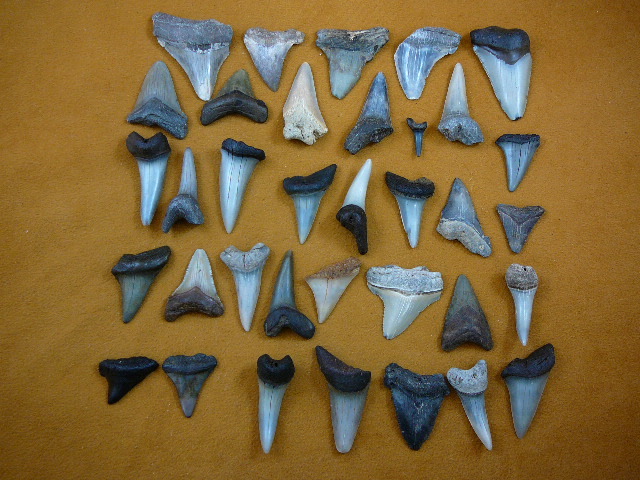 (average 7 species of shark teeth possible: tiger, sand tiger, hemipristis, dusky, bull, lemon, mako shark); may contain a few fish vertebrae. 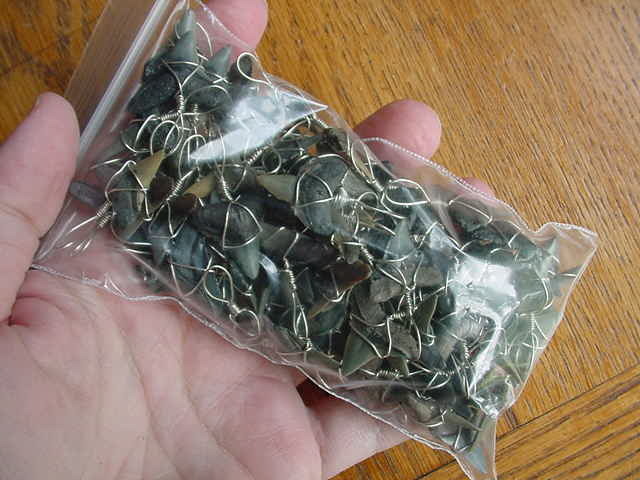 Excellent quality item for party favors, your own craft work or jewelry, salting fossil areas for scavenger hunts, or for fossil collectors young and old. 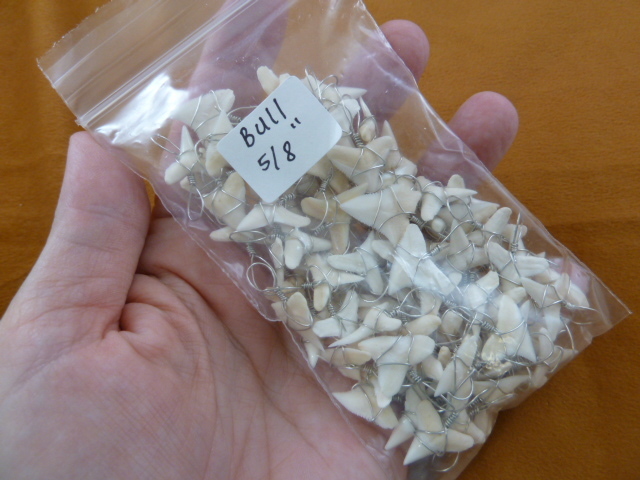 Individually photographed; at least one jewelry quality tooth in each package. 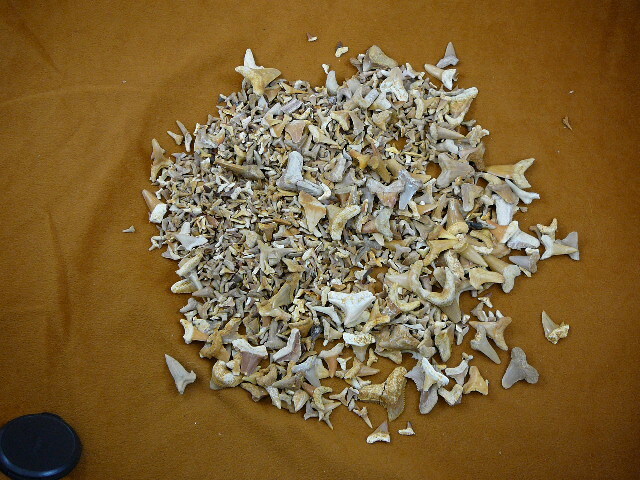 Average size of teeth: 7/8" to 1-3/4"
Your choice of any of the 4 above to make a dozen - Special Wholesale priced! 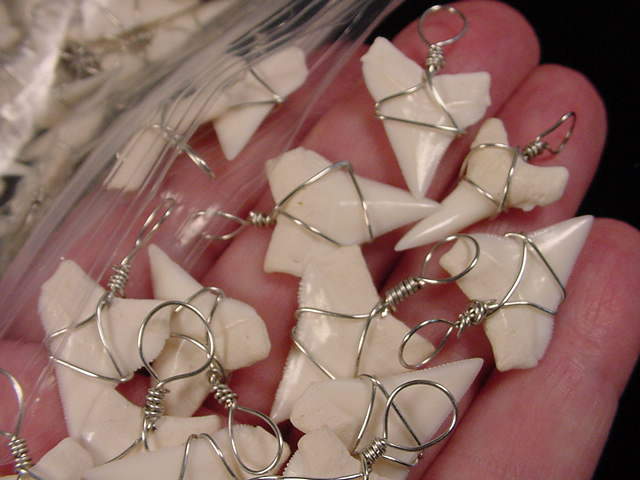 One dozen minimum; shipping $8 domestic, $13.50 outside U.S.
1 dozen minimum, shipping $8 domestic, $13.50 outside U.S.